Advisors across campus gathered on September 12, 2017 for the annual Fall Welcome event where Executive Director of Academic Advising, Brett McFarlane and others throughout the campus community shared updates and information relevant to academic advising. 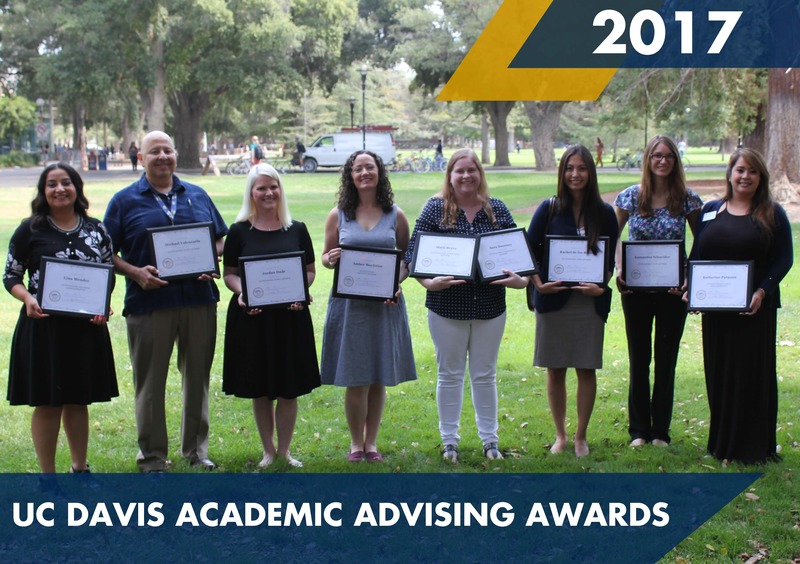 The Fall Welcome event concludes with the UC Davis Academic Advising Awards presentation to recognize outstanding contributions by advisors. Jinni Pradhan of Middle Eastern and South Asian (ME/SA) Student Life explained the population of students who identify as members of the ME/SA community. A sense of community is important for ME/SA student success. Refer to the slides for related campus resources and contacts. Justin Smalley, Abby Mansour, and Thomas Lozano presented on the newly formulated Onboarding subcommittee of the ATPD. The subcommittee is developing onboarding resources for new hires, such as potential online technology training and the opportunity to forge new connections via an “Aggie Advising Ambassador” program. The Academic Advising Office will make updates to the website via the Professional Development page once these new elements are operational. Leanna Friedrich updated the audience on Peer Advising subcommittee developments. The inaugural year for the Academic Peer Advisor Certificate was a success; eleven peers completed the program and received certificates. Academic peer advisors are invited to participate in this year’s program, with applications due by November 3, 2017. Also, the subcommittee is holding quarterly events for advisors who work with peers to connect with colleagues, continue dialogue about best practices and strategies for peer advising, and set goals for the year. Natasha Coulter shared updates about plans for Coffee Talks for the coming year. While previously these events focused more on resources around campus, the committee continues to shift the focus toward a broader topical approach. The new Coordinator for Entry Level Writing and the Upper Division Composition Exam, Kayla Timmons, shared important dates and highlights from the University Writing Program. Refer to the slides for specifics on dates and requirements. Jinni Pradhan of Middle Eastern and South Asian (ME/SA) Student Life took care to explain the population of students who identify as members of the ME/SA community. A sense of community is important for ME/SA student success. Refer to the slides for related campus resources and contacts. Director of the Ombuds, Katherine Greenwood provided the audience with general information about the Office of the Ombuds, including the explanation that they offer students, staff, faculty, postdocs, and administrators a safe, confidential, neutral space for dealing with conflict. She also normalized the idea that conflict is natural and inevitable; the Ombuds Office might be a useful resource for those experiencing such conflict. Brett McFarlane, Executive Director of Academic Advising, began with updates on technology and an acknowledgement that advisors may face some challenges this year with My Degree in its student-facing infancy and changes in OASIS support. He shared leadership transitions in committees, DDAR, and community groups for the coming year. McFarlane also announced details for upcoming UC Davis hosted advising conferences: the 2018 NACADA Region 9 Conference in Santa Rosa March 21-23 and the 2018 UC Davis Academic Advising Conference at the UC Davis Conference Center in February. Vice Provost and Dean of Undergraduate Education, Carolyn Thomas expressed gratitude toward the advising community for their resoluteness through periods of change and uncertainty, as well as their unequivocal commitment to students. As the chief representative for Undergraduate Education, Thomas pledged to continue to represent and advocate for academic advising as an essential element impacting student success. The Fall Welcome concluded with Assistant Vice Provost, Helen Frazier, announcing and sharing highlights about recipients for the third annual UC Davis Academic Advising Awards. Congratulations to the 2017 Academic Advising Award recipients!